The Setup Software that comes along with your router may not work with Windows 10. If you are experiencing difficulties setting up your router on Windows 10, you may need to do it manually. For Linksys Smart Wi-Fi Router setup, use the latest version of Internet Explorer®, Google Chrome™ or Firefox®. NOTE: This article assumes that you already have a different browser installed in your computer. If you do not have one yet, go to your alternate browser’s download site using Microsoft Edge and install it. Close or minimize the Edge browser. 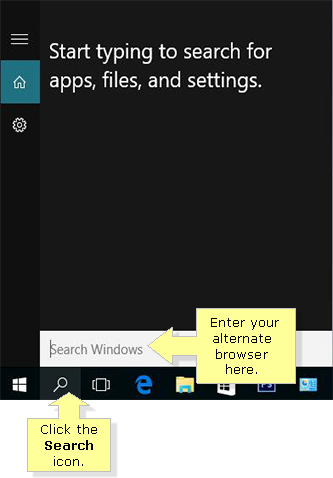 Click the Search icon on the taskbar then enter the name of your alternate browser in the Search Windows field. When the search results appear, click your alternate browser to open. Additionally, if you have a Linksys Smart Wi-Fi Router and you are using or planning to use the Virtual Printing feature using the Linksys USB Control Center printer utility, make sure to download the latest version. You should be able to download version 2.1.0 which adds support for Windows 10 through the web interface. To learn how to connect a USB printer through the Linksys USB Control Center utility, click here. We are building out more information on updates and compatibility every day. Please check back for additional updates on Windows 10 drivers or software support.